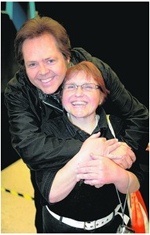 Swooning fans brought a supermarket to a standstill yesterday as '70s heartthrobs The Osmonds came to town. 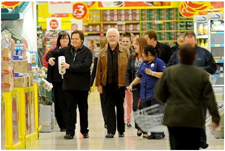 Jimmy, Merrill and Jay Osmond dropped in to the Tesco store in Hamilton to sign copies of their new album, Can't Get There Without You. 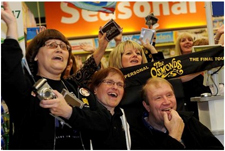 There was an emotionally-charged atmosphere in the store as scores of women, some having travelled from as far afield as Ipswich, Macclesfield and Cornwall, waited to meet their idols. There were cheers and sobs as the brothers, who also performed a sell-out gig at Leicester's De Montfort Hall last night, finally appeared. Michelle Duffield, 50, from Narborough, brought along her 1972, seven-inch single of Jimmy's solo hit Long Haired Lover From Liverpool for the brothers to sign. "I've loved them since I was a teenager and used to collect posters in Jackie magazine," she said. "I've waited 30 years for this chance to meet Jimmy, Jay and Merrill. It was fantastic to finally meet my teenage heartthrobs in the flesh." Kaz Gordon, 49, from Glenfield, said: "I've seen the Osmonds play all over the world, so it's extra special to see them here in Leicester. "It was fantastic. They're all lovely! They are so generous with their time and call their fans friends, not fans." Pat Gibson, 50, from Netherhall, Leicester, said: "I have tickets for the concert but only found out a few minutes ago they were going to be here." June Kilner, 53, from Whetstone, said: "I didn't get much ironing done this afternoon but wasn't going to miss this for the world!" Miranda Krawczyk, 50, from Rutland, said: "I must admit, I felt a bit emotional." The three brothers spent more than an hour greeting their fans, signing CDs and posing for photographs. Jimmy, who turned 49 on Monday, said: "I'd like to say a great big thank-you. "We don't deserve their loyalty but it is so touching. "We've never taken it for granted and are so grateful to everyone for taking the time to come and see us." 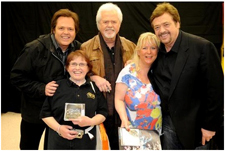 The last time the Osmonds were in Leicester was in 2006, when they also played De Montfort Hall. This time around they were without Wayne, who had to stay at home due to a illness. Jimmy last visited Leicester in 2009 when he performed in the musical Chicago. He said: "This tour is a great big thank you to all our fans for their love and support through the years."